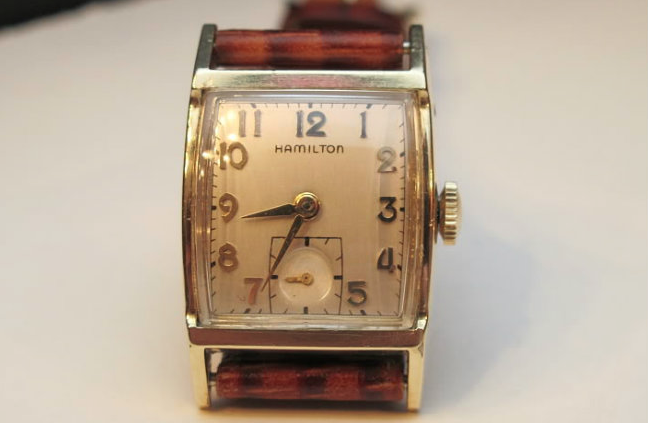 The 1953 Hamilton Raleigh was only made for one year and it's a fairly uncommon model. It's also the second model to feature the Raleigh name - as the original Raleigh was introduced in 1930. The Raleigh features a 10K gold filled case in yellow. The dial is sterling silver with solid 18K gold numerals. Under the dial is a 12/0 sized, 19 jewel 753 movement. The 753 replaced the 14/0 sized 19 jewel movement - the 982 - that Hamilton had used since 1935. 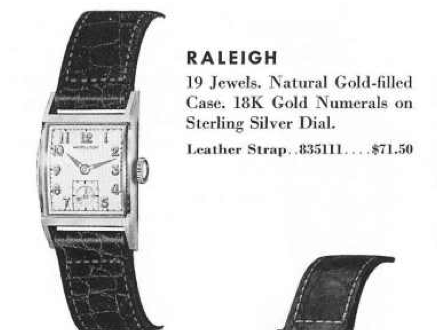 You may recall that solid gold models got the 982M movement - called a "medallion movement". The replacement for the 982M was the 12/0 sized 754 movement, also with 19 jewels. The 754 is largely the same as the 753 except that it "has superior finishes and features comparable to the well-known Hamilton Medallion series of movements." So if you see a 754 movement in a gold filled case you know it's a replacement.